Polka Dot Overload | Sewing, knitting & vintage projects, tips, tutorials and cartoons! : Sew Grateful Guest Reflection: "Surrounded by Sewing"
Sew Grateful Guest Reflection: "Surrounded by Sewing"
Above: A lovely doll my mother made when she was learning to sew in the early 1960s. "She’s lost her face and is a little sad-looking but notice the fancy hairstyle and the gathers on the sleeves and bodice. She used to have a petticoat and pantaloons but they are gone now." How much are you loving Sew Grateful week? A big thank you to all my long-time and new readers who entered my first giveaway--it's so much fun to read your plans for what you might do with your winning vintage pattern! Tomorrow I'll be sharing the story of how my beloved grandmother Melba taught me how to sew in a bittersweet week bookended by a road trip to a Mississippi funeral and a scary ambulance ride to a small Georgia hospital. And this weekend I hope to share my finished Sew Grateful sewing project. "I grew up surrounded by women who sewed. 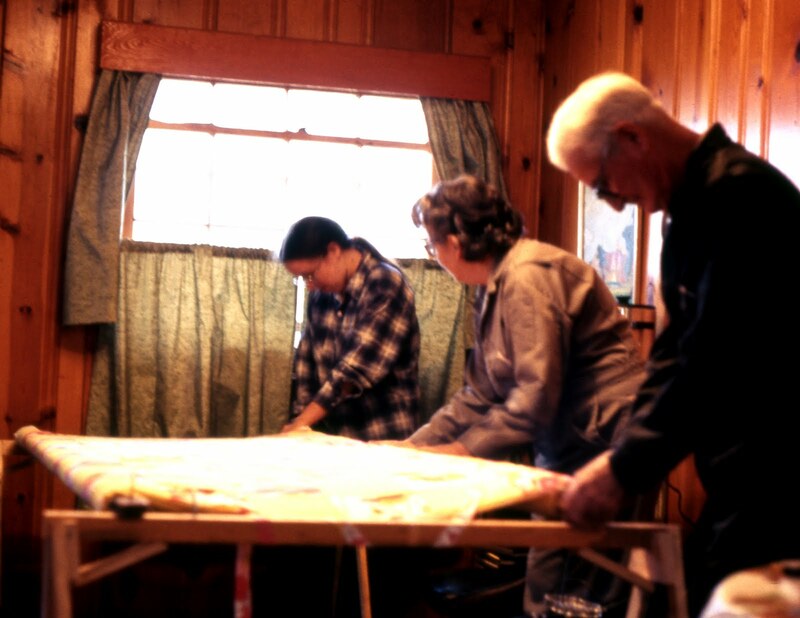 My grandmother Drue was my first sewing teacher. I was living with her in Corinth, Mississippi in the summer of 1960 (I was about eight years old). There was, of course, a sewing room in the house, with an amazing pedal driven sewing machine. "Me (in school photo) the year I learned to sew... in Corinth, Mississippi." I had been sewing “by hand” for a long time, for as long as my memory goes back. 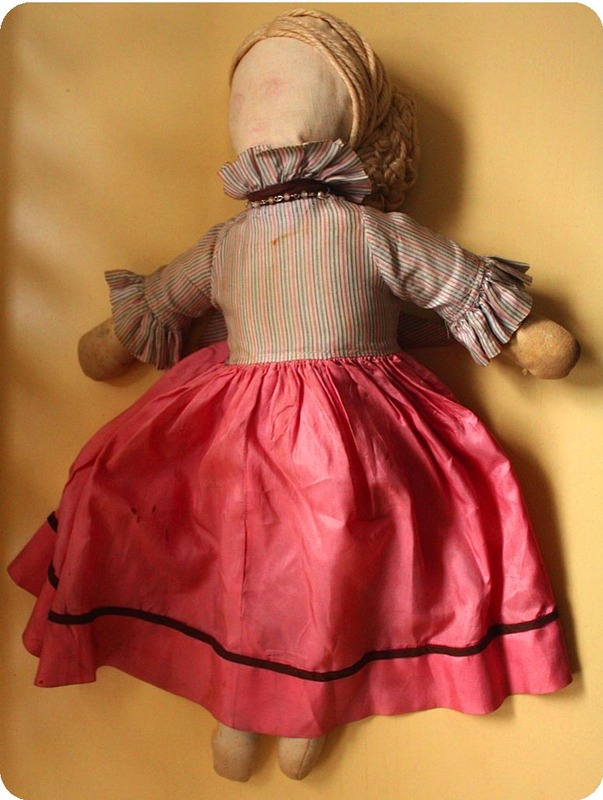 I had just finished making a doll that wasn’t really for playing with... it was a Civil War era doll that reflected my obsession with history. I wanted to make a really detailed and authentic period costume for the doll. "This is a photo of us kids, sitting on one of the rag rugs my grandmother made at the house in Corinth. I'm on the far left." My grandmother decided I should learn to use the sewing machine for the doll’s costume. She sat with me for days, making sure I knew how to thread the machine and run it. Her method of teaching was gentle, but “hands off”. She let me make all my own mistakes and knew that getting me started was all that was needed. There was no “hovering” or nagging or recriminations... at all! "This is a picture of my sister Melinda, my cousin Pam and my brother Michael... my grandmother Drue made all these clothes." Most of the time I was left alone with the machine, my imagination and time to figure out what to do on my own. She might suggest some techniques... especially the gathering of the skirts and pantaloons. She would show me, then leave the room. Often, she would be in the next room, working on one of her own projects. "Drue (center, between my sister Becky and grandfather Garland) sets up a quilting frame in preparation for a quilting bee." She scorned the use of pins... a few upside coffee cups on the pattern were enough. She also didn’t really believe in chalk or marking... a dart should be memorized and just done. Speed was important to my mother. She worked full time as a book keeper when I was growing up, so sewing was done after a long day and was often because she wanted a new outfit for herself or me and my siblings—it was a practical activity. She did love to dress up (she inherited this from her mother!). They looked like models from a magazine to me and I admired them as gorgeous, stylish and capable women. By the time I was eleven, I had progressed to making my own dresses for school. I remember one dress, it was a turquoise blue “mini” dress (remember this was the time of the “British Invasion” and skirts were inching up!) it was sleeveless and had a large double ruffle around a scoop neck, almost like a big necklace or flower lei. I can’t tell you how proud I was to wear it to school!" 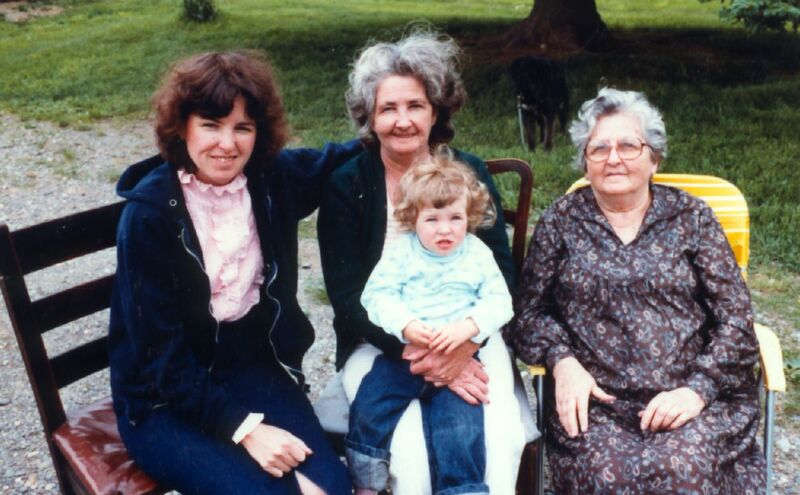 Four (sewing) generations:Beryl, Melba (holding Mikhaela) and Drue in the early 1980s. 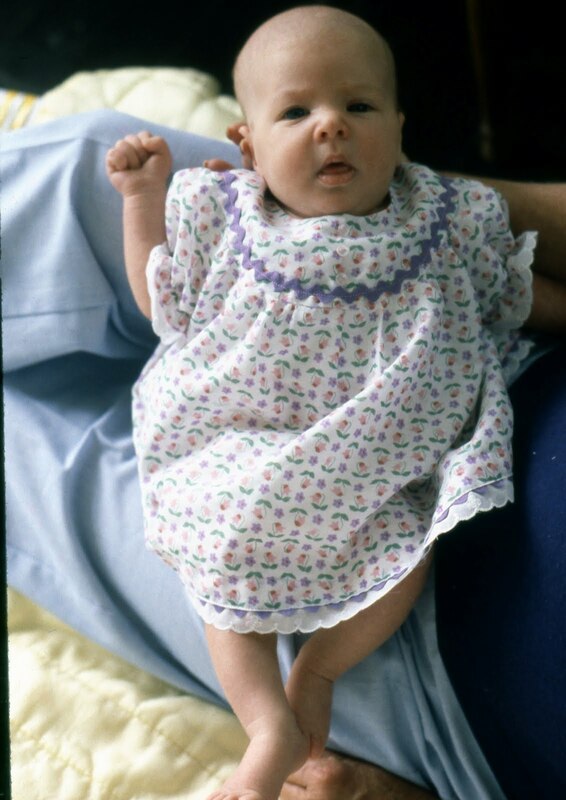 I'm afraid I don't have any pictures of my mom's ruffled blue mini dress, or of any of Drue's beautiful quilts (my mom thinks there might be one in her attic but she couldn't find it)... but here's a bonus photo of me as a baby in an outfit my mom sewed for me--I love the sweet purple rick rack! 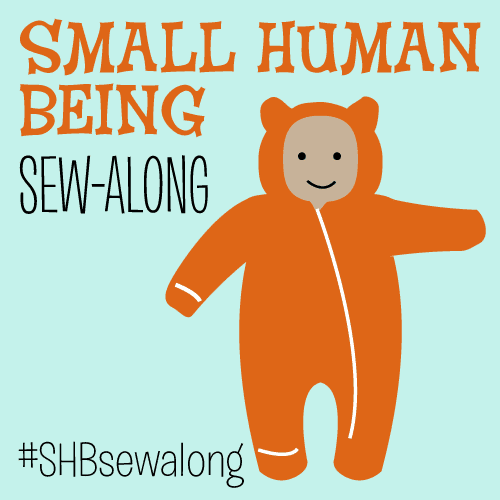 So tell me, dear readers--do you have any family sewing traditions? Sewing and making isn't really a tradition in itself in my family, my mom and I are the only ones left that sew. But one major tradition (that might not be sustainable without my grandma around anymore) is that everyone wears a handmade wedding dress. I absolutely LOVE this post! A big thanks to your mom for the guest post and I really adore that doll she made in the top picture!! I'm always so envious of those who had moms, aunts or grandmothers to teach them to sew. 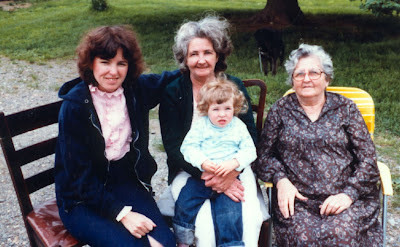 My grangmother sewed when she was raising her family, but not so much by the time she had grandkids. So, although I inherited her sm, I never did get a lesson from her. I think its wonderful that you and your fabulous mom appreciate that family tradition! What a beautiful set of memories about learning to sew! I never knew my grandmothers at all, but I treasure the time spent with my mom at the sewing machine. My whole family is a family of makers, but my mom and sister and I are the only ones who sew. Fantastic post! I love the family phot and the resemblance is really strong. How awesome to have a family tradition that is so creative. Yes, I do!Cheers from the heart of Europe! Such a cool tradition :) Kind of like my knitting tradition :D My grandmother taught me to knit- she learned at school on matchsticks! What a beautiful post!! I wish I could get my grandmother to open up like this with me. She just got totally pissed with me for posting her picture of "myface" lol. What a great sport your mom is! And a great story teller. I loved looking at the photos. My family (on both sides) are from the south, too. What a sweet post! You are so lucky to have women who sewed in your family...no one taught me to sew more than a button on, so I started taking classes a couple of years ago. How wonderful that you'll be able to pass on your skills to your daughter.